A US-based cyber security company is to create 100 jobs in Cork. Forcepoint said the staff would be hired during a three-year expansion plan, with most of the jobs coming on stream in year one. Forcepoint is a cyber security software developer based in Austin, Texas, and it was established more than 20 years ago. The company provides cloud security, network security, as well as data and insider threat security for 20,000 government organisations and enterprises in 150 countries worldwide. 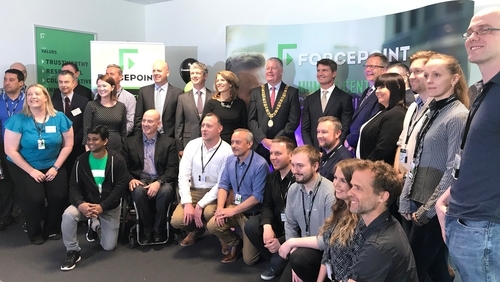 Forcepoint opened a new office in Cork this morning, with support from the Government through IDA Ireland. The company said 100 people would be employed at the Cork office, with most being hired in year one, mostly in the area of software engineering. IDA Ireland said the announcement highlighted Ireland's attraction as a location for international software and cyber security companies. Recruitment for the new positions has already begun. Separately, Data analytics company Trūata has announced plans to recruit 75 people for its newly opened headquarters in Dublin.